Sand-casting is a very versatile method to make castings. Molten aluminum is poured into a sand-mold to duplicate a desired pattern. Almost any pattern can be pressed into a fine sand mixture to form a mold into which the aluminum can be poured. It is a centuries-old process that continues to supply parts to many industries. Many parts are made of cast aluminum and the applications grow, as aluminum remains a good choice because of its many positive features. The automotive industry is the largest market for aluminum castings. Cast aluminum is also widely used across the transportation industry, including aircraft, and marine. Cast aluminum also plays a big part in appliances, hand tools, kitchen cookware, landscaping, sports, and machinery of all kinds. Sand-casting is often used to produce parts with hollow cavities and complex arrangement of ribs, voids, and unusual shapes. The process begins with a customer’s drawing, print or sample. After discussions with the customer, the initial step is to build tooling. 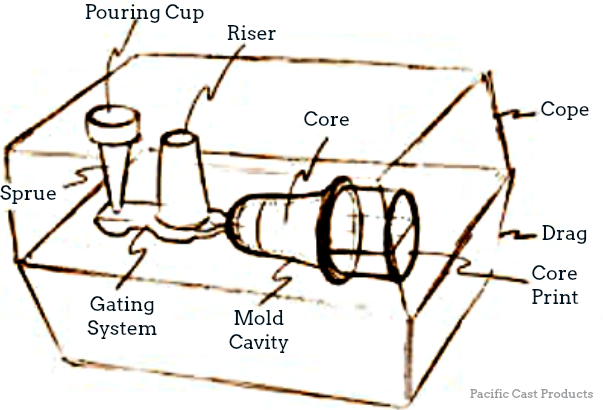 Tooling is required to allow workers to form the sand mold. The foundry workers and pattern-makers typically provide input to the design and the tool-making process with suggestions on design modifications or tool building that will increase casting efficiencies, improve the part, or reduce cost to the customer. If the casting is to have any internal cavities, or has negative draft, this is the time when any core tooling is made. The tooling allows cores to be made from fine sand. These cores are used only once in the casting process. At this point, the first few castings are made for customer evaluation. These castings are carefully inspected and any final changes are made to the design and all dimensional and finish issues are corrected. Once approval is received from the customer, the part goes into production. The raw material for the casting process is aluminum ingots. Various alloys can be used including: 319, 356, A356, 535, and others. Aluminum ingot is purchased by the foundry complete with lab reports to confirm its composition. The ingot is placed in the crucible of the melting furnace. The silicon carbide crucible is capable of holding the molten aluminum alloy. The aluminum is heated to over 1300 degrees F. Temperature control is accomplished through the use of thermocouples. 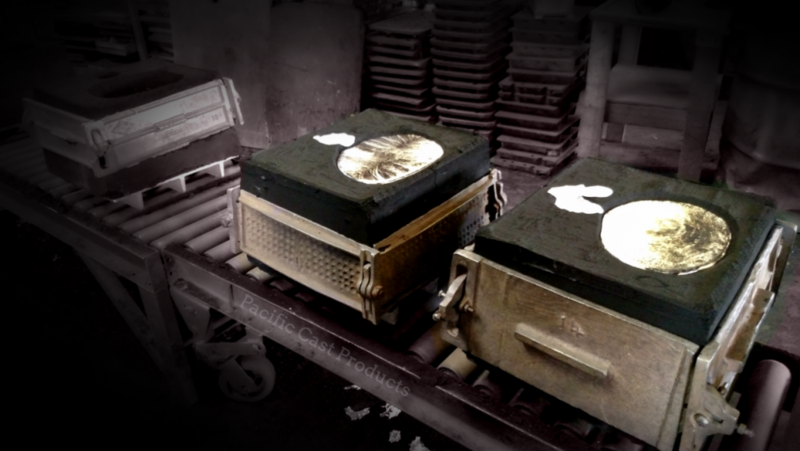 The most important component in the casting process is the tooling used to make the casting. The quality and accuracy of the tooling used is a major factor in the quality and accuracy of the casting that is produced. A good tool is also easy to use and performs well repeatedly. Making a good tool often involves many skilled professionals including: engineers, pattern-makers, tool-and-die machinists, quality engineers, and foundry workers. Since it is possible for a tool to make as many as 15,000 or more castings, it is worth the effort to design and build a good tool. Molten aluminum is taken from the melting furnace by using a ladle, and is poured into the sand-mold and allowed to solidify. Once enough time has passed, the mold is dumped or broken up to allow retrieval of the part. Risers, gates, inlets, and other flash are removed from the part by using a band saw. Once the casting is cut from excess material, finishing operations can be as simple as de-burring or grinding off sharp edges, to grinding and sanding all surfaces smooth. Depending on the alloy used, the castings may be sent through a heat-treating and aging process. Heat-treating improves the mechanical and physical properties of the casting. Castings are loaded into ovens to be heat-treated. The amount of time the castings are in the oven and the temperature of the oven are factors that determine the temper of the alloy. Parts are then readied for shipment to the customer. Many additional services can also be supplied to the customer. Castings can be finished in many ways and the parts can be supplied complete, packaged, and ready to sell. To explore how we can supply you with the necessary casting for your products, please contact us at (562) 633-6673.